I took a ceramics class a few years ago. I loved it, but unfortunately, almost everything I made ended up cracking in the kiln. This piece was no exception. One of it's ears fell off. Luckily, however, it wasn't anything a little super glue couldn't fix. Cool. There sure are a lot of EDM challenges huh? I think ceramics is a great medium. This piece has a lot of life to it. For some reason I am reminded of the doorknob in Disney's Alice in Wonderland. Who knows why my brain works that way. Ha! 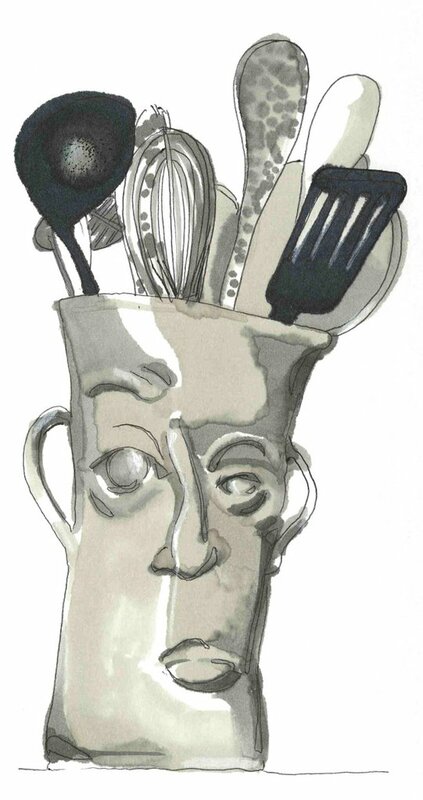 Great sketch - and great expression on that face, "Pleeease, you're not seriously thinking of usting that spatula are you?" Very fun. It must be such a cool piece! How did you 'color' this? With ink? I love your black and whites -- and i dig the expression on his face! Oh i just remembered what his face was reminiscent of: the animated objects by Roland Topor. I think you would like his stuff. Great picture again. Is it an ink wash? It has, as usual, great charachter. Andrea, France-I see how this looks like an ink wash, but its actually Chartpak Markers. They tend to bleed (which can be both good and bad depending on what you are trying to achieve.) In this case, because of my sketchbook paper, they bled a lot. Its so interesting to hear everyone's take on the character of my piece. France- I checked out Roland Topor's work...I do really like his stuff. Oh grilled cheeze, i love this one. Very good sense of light!!! i am so proud of your work! This is so dear, Suzanne! I love seeing all the aspects of your developing style. that's awesome, and your drawing is super great too! This is so wonderful. Lots of character. I wonder what you used for color? Great drawing.